India as a country is full of temples which are old and new, small and very large. Various Hindu Gods and Goddesses are worshipped since centuries in this land, known for its primary religion Hinduism. No city or village is without its own set of temples and shrines. Religious tourism is big business with sincere and faithful Hindu religious devotees thronging places like Badrinath, Ujjain, Haridwar, Nasik, Ayodhya, and Dwarka, to name just a few. Temples of different shapes and sizes have always added to the beauty of urban scape and rural landscape alike. And they can be ornately designed expensive huge structures or just a small single stone piece kept under a tree on a raised platform, with saffron colour plastered all over to attract innocent devotees. You can find a temple in a deep dense forest, in an uninhibited valley, on hill tops, deep gorges of difficult mountain terrains, in much less populated village or right on the main road of any bustling Indian city, across the length and breadth of the vast country. Well, I am talking of a group of special temples famous for their architectural grandeur and are several centuries old. They dot the southern Indian landscape, more prominently. Temple architecture is an interesting branch of knowledge in our country not merely for the budding architects, religious devotees or a historian, but for a layman too. The book that I am introducing to the cross section of readers here is an exquisitely produced and well-researched volume on the 106 temples spread across India, mainly in the southern part of the country. And these are proper temples, built at different times and are the established abodes of Vishnu. Of them, eighty-four are in Tamil Nadu, eleven in Kerala, two in Andhra Pradesh, eight in North India (mainly in UP) and one in Nepal. According to the author, the remaining two temples are in mystical realm and a pilgrim upon completing pilgrimage of all these 106 temples, gains access to the rest of the two temples. Collectively, the bunch of these Vishnu temples are known as the 108 Divya Desams, amongst the Vaishnavites, more particularly from those from the Southern India. World famous Tirupati is among these temples! As most readers would know it, Hinduism has two major sects with huge following in India, as also, abroad. Shaivism and Vaishnavism are those important sects that are followed by Lord Shiva and Lord Vishnu, respectively. Vishnu followers are known as Vaishnavites. This superbly illustrated book unfolds the grandeur of the magnificent temple structures dedicated to Lord Vishnu. A Vaishnavite is believed to attain moksha (salvation) if he pays homage to Lord Vishnu at these 106 earthly abodes and will thereby be granted access to the two heavenly ones. This is something unique. The author has not only visited all these sites, he has done extensive research on the temples, their history, legends associated with them and architectural styles that have been influenced by the local dynasties and period, besides geography. In temple architecture, the structure is revered as a symbolic representation of God's form where the topmost point of the temple is the head; the sanctum sanctorum is the heart ; the front hall is the stomach and the main gate is the feet of the Almighty. The idol of the deity in the sanctum is the pivotal point akin to the soul of the being. While another theory equates the temple to a minuscule exemplification of the universe with the deity image as the moving spirit and the peripheral areas of the temple structure as encircling layers containing the universe. If we look at the long history of temple building in India, it clearly is evident to even a layman that initially the austere shrines were made out of bricks and mortar, usually around trees; later time temple structures have exceedingly evolved manifold. The sequential array of the Gupta, Pallava and the Chalukya dynasties and the Chera, Chola and Pandya empires of the South India have hugely contributed to temple construction. Temples have been considered as the storehouses of past history, art, architecture and the like. The prime reason that led to the birth of a temple structure was the awakening in people for the need of a sacred place to converge and revitalise their spiritual energies. Over the years, the Indian temples evolved as comprehensive institutions where people congregate for discourses, cultural performances and festivals, besides offering prayers. This book is full of all this and more as the temples dealt with are all beautifully made intricate structures of imposing styles and unique elegance-- some made of granite, others of wood, mainly in Kerala. The images, the history and art that is captured in this book would surely make readers flip through its glossy pages at will. You can open any page and start adoring the details of the temple deity, the doors, the colours, the ceiling or towers and the complete architectural elegance of entire building. According to the ancient Sanskrit texts, the ideal spot for temples are beside naturally formed water bodies such as ponds and rivers or lakes. In the absence of such a water body, a temple pond is to be ideally constructed in front or the left of the structure. The Hindu temple architecture is symmetrically set structure deployed with precise concrete squares and circles the four cardinal directions form the axis in temple construction. In a temple structure, the author tell us, concrete squares of each layer is significant in its own way. Though giving greater details of all temples would be difficult here, the first temple of the series of 108 definitely needs a detailed mention. It's the temple of Sri Rangathan, (Vishnu) the presiding deity. It's situated near Trichy in TN and is considered the largest temple in India, abundant in history and legend. For the Vaishnavites this the most important of all. Situated on an islet created by the rivers Kaveri (Cauvery) and Kollidam, the temple and its complimentary structures are set in a massive compound of about 156 acres within a perimeter of 4116 meters. The presence of seven precincts (prakaras) is a feature unique to this temple. Out of the 21 towers, the 236-foot long Rajagopuram is second tallest of its kind in Asia, according to the author. Such interesting facts the author has given in his book, page after page with details of the antique sculptures that adorn the temples. He says each temple has its own sacred pond nearby--natural or man made. Along with history of the temples and the festivals celebrated locally and uniqueness of an individual temple, the author has taken pains to delve deep into history to help a reader gain new insights into religion, architecture, history and aesthetics besides geography and arts. This approach of the author in producing the volume makes this books a valued reference document for urban planners and architects without any doubt. The temple Thiru (Thiru means Shri) Neermalai in Chennai, for example, as the history tells us, that Sage Valmiki wanted to see the wedding ceremony of Lord Rama. The Lord, along with Sita Devi, his brothers Lakshmana, Shatrughana and Bharata appeared before the sage who requested him to stay in his place for the benefit of his devotees. The temple is situated atop a hill and the Lord is seen here in all four postures--standing, sitting, reclining and walking. This temple is considered as self-manifested (Swayam Vyakta Kshetra). While most temples are situated in the South, temples in the northern India are at Thiru Ayodhi in UP (Faizabad) while the one of them -- Thiru Naimisaranyam -- is situated near Sitapur also in UP and is self-manifested too. There are eight such temples. Author, himself a photographer, has provided pictorial details of all temples and the idols inside, unique features of temples towers, walls etc. It gives glimpse of of Uttarakhand temples at Badrinath, Devprayag and Joshimutt and in Gujarat (Thiru Dwarka). The Badrinath temple is simply extraordinary, thanks to the surrounding mountains, adding to its natural beauty. This Thirubadhari temple is situated 325 kms up from Haridwar on mountain roads, close to the banks of river Alaknanda. The book also talks about the Nepal temple, only one temple out of India of the 106. Why and how these locations were chosen, who chose them and how they were built is little unclear from reading the book though author hints at different dynasties behind the construction of such splendid structures at different times. 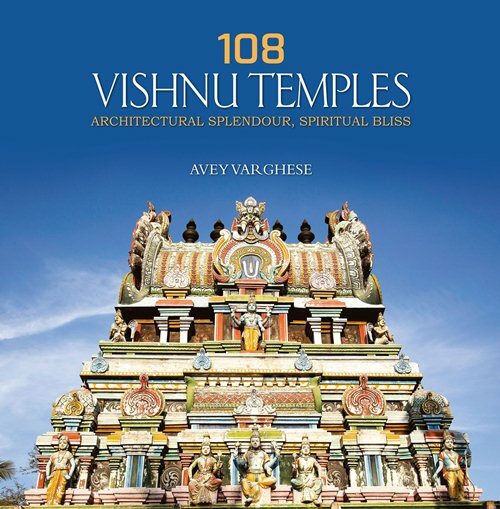 Name of the Book: 108 Vishnu Temples -- Architectural Splendour, Spiritual Bliss.